Sad films make you fat – so don’t watch them! 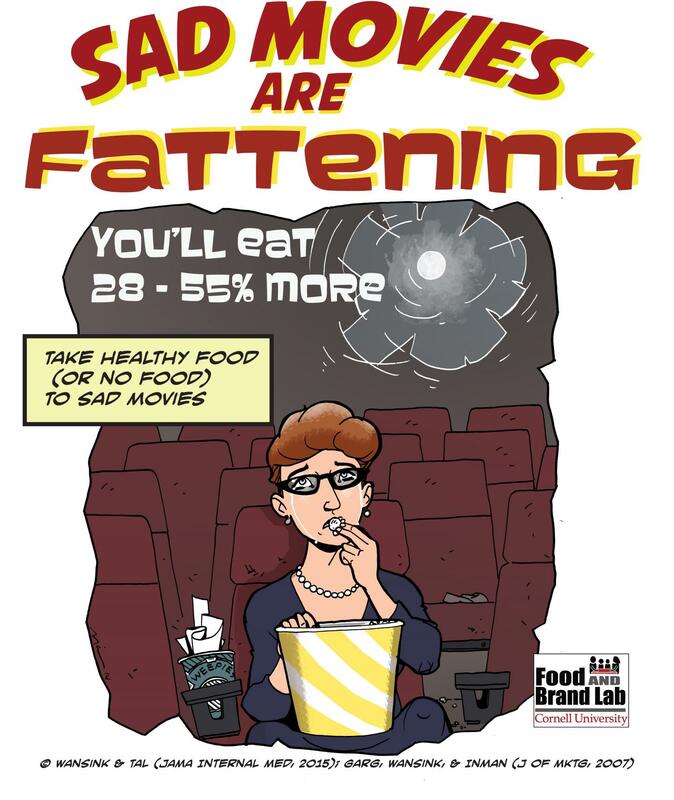 Home/Sad films make you fat – so don’t watch them! Sad movies are bad news for diets. A newly reported study from the Cornell Food and Brand Lab showed movie-goers watching tearjerkers ate between 28% and 55% more popcorn both in the lab and in a mall theater during the Thanksgiving holiday. According to findings published in a JAMA Internal Medicine research letter, movie goers ate 28% more popcorn (125 versus 98 grams) when watching the tragedy Love Story than when watching the comedy Sweet Home Alabama. Dumpster diving analyses of discarded mall movie popcorn in seven cities across the US, showed similar results over a Thanksgiving weekend. After weighing discarded popcorn and counting popcorn boxes, Cornell Food and Brand Lab researchers found that moviegoers who bought popcorn and watched a sad movie, Solaris, ate an average of 55% more popcorn (127 versus 82 grams) than those watching the more upbeat movie, My Big Fat Greek Wedding.